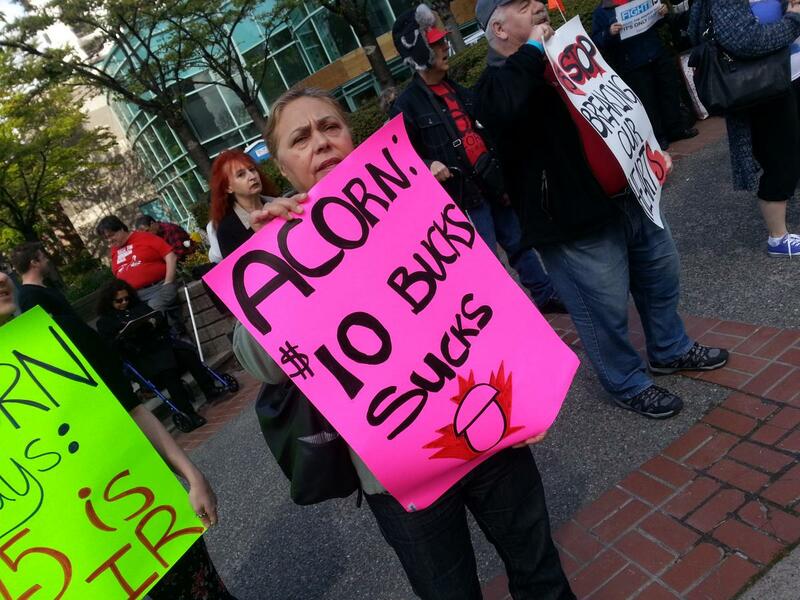 On April 15, 2015, ACORN Canada members in Ottawa and BC held actions on our Wages Rising campaign to demand $15/hour. 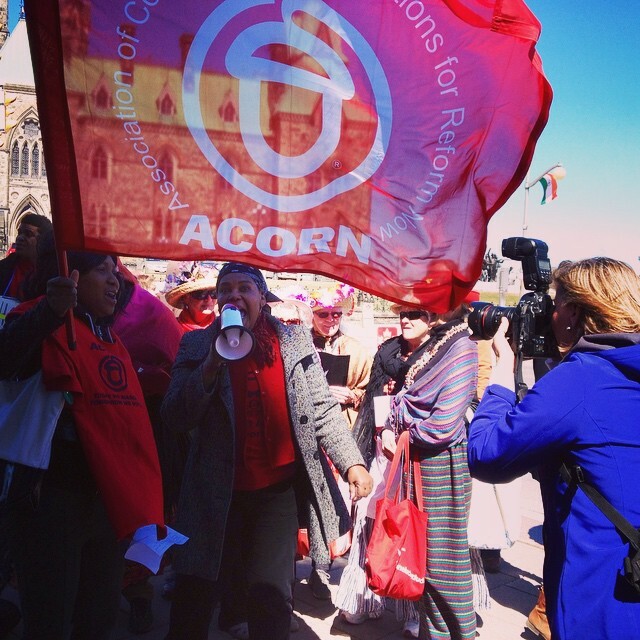 Ottawa ACORN members rallied for a federal $15 Minimum wage, as part of our wage sector campaigns, with over 60 people in attendance at the PMO's office at 80 Wellington. We received press in the Ottawa Metro, the Ottawa Citizen and two freelance journalists. Allies in support included OPSEU, ODLC, PSAC, SAA, Unitarians for Social Justice, SEIU local 2, CUPW and more! Members Grace Iyabosa and Marie-Loudres Garnier led an energetic action. Both members are working minimum wage and low wage jobs, and encourage all members to join the fight in our Wages Rising campaign! 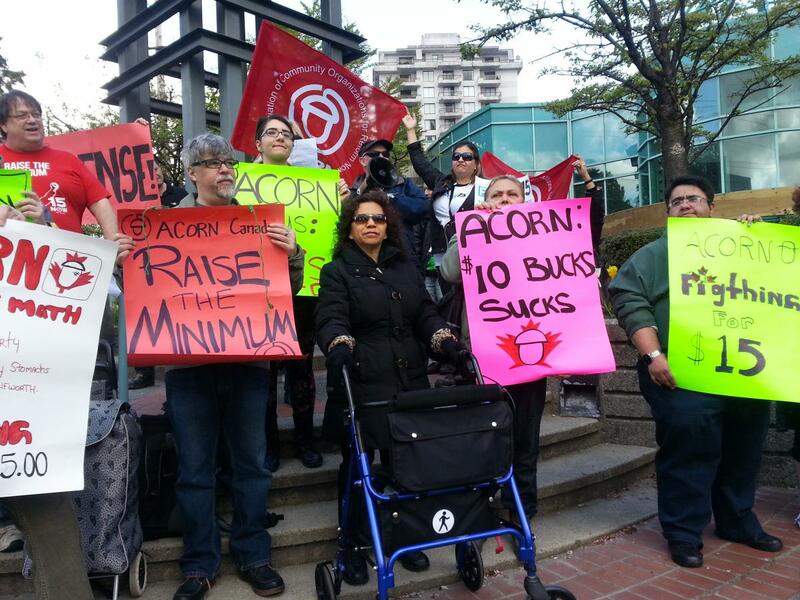 In New Westminster, BC, approximately 40 ACORN members enthusiastically demonstrated against Christy Clark's paltry 20 cents an hour raise to the minimum wage, demanding a 15 dollar per hour wage. New Westminster ACORN member Laura Cairns did a fantastic job leading the action, and was supported by members Rick Hardy, Morgan Sinclair, and Monica McGovern. The action began at the steps of an under construction Walmart location, with members chanting "How can we survive on 10.45? 20 cents is nonsense! 20 cents is nonsense!". Then, following a march through the streets of Uptown New Westminster, the action finished up in front of a local McDonald's with members petitioning and speaking with passersby about the campaign.